Facioscapulohumeral muscular dystrophy (FSHD) is a relatively common myopathy affecting 1/8500–15,000 individuals. FSHD is caused by inappropriate expression of the transcription factor double homeobox protein 4 (DUX4) so gene therapies must either prevent expression of DUX4 or interrupt the pathogenic downstream effectors of DUX4. The autosomal dominant inheritance pattern and the fact that the primary pathology is limited to multinucleate muscle fibers make gene therapies a challenging prospect for this important dystrophy without a treatment. Genetic correction of even a large percentage of myonuclei may not be sufficient to produce a phenotypic change in the setting of multinucleate myofibers when the disease is caused by a dominant-negative mechanism. 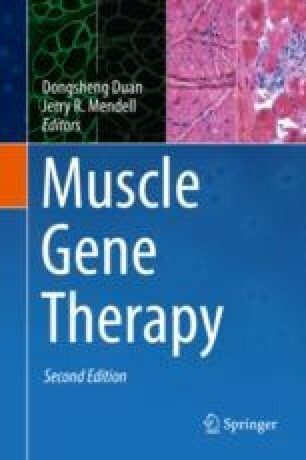 In this chapter, I outline what is known about the molecular pathology of FSHD and discuss several gene therapy approaches to interrupting the cycle of DUX4 expression and muscle cell death.